Jonah is first cast into the sea by sailors. The boat is without sail for the storm is raging wildly; the men hold Jonah by his feet and his head is sometimes directly shoved into the mouth of the fish. Jonah is then cast out on the shore; one can see his head and part of his body coming out of the fish’s mouth. Jonah is sometimes in prayer; he thanks God for saving him. In front of him, one can often see the walls of Niniveh, the big city to whose inhabitants he must announce they are going to perish. What kind of sea monster is it? 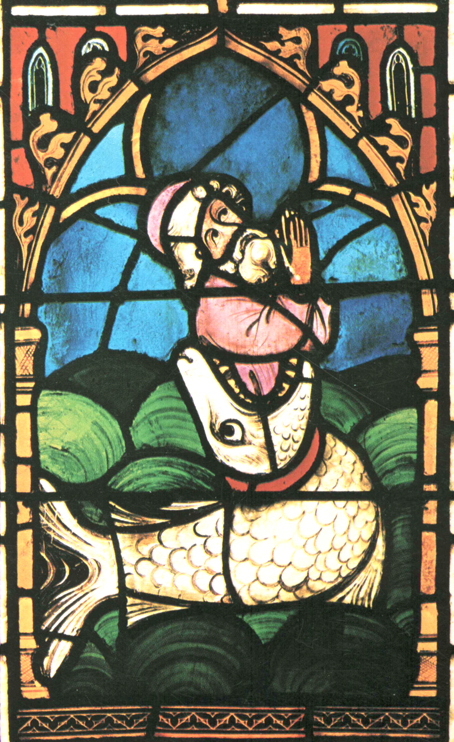 The Bible mentions a big fish; Matthew’s gospel refers to a sea monster. Then why is there often a whale to be seen? Probably because it is better known by the Europeans and the fear it rouses conveys very well the idea of death, while its size allows a stay inside its belly. 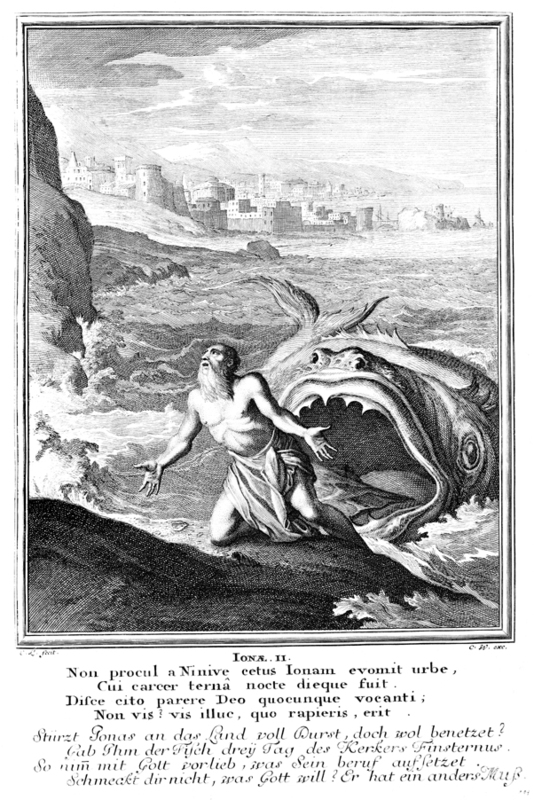 The story of Jonah was often represented in the antiquity for it was an image of salvation. The prophet was then naked like an athlete whereas, in the Middle-Ages, he was dressed, even when coming out of the fish. From the Renaissance on, the representation of the narrative has become rare but folklore has kept the memory of Jonah and the whale. The story of Jonah is a real small novel. God asks him to go to Niniveh and to announce to its inhabitants that the wrath of God is going to fall on them because of their wickedness. Jonah, who is afraid of the inhabitants’ reactions, flees in a boat. But once at sea, the storm breaks out furiously and the sailors think that Jonah is responsible for the tempest. So they took up Jonah, and cast him forth into the sea: and the sea ceased from its raging... Now the LORD had prepared a great fish to swallow up Jonah. And Jonah was in the belly of the fish three days and three nights. Then Jonah prayed the LORD his God from the fish's belly, And said, I cried to the LORD by reason of my affliction, and he heard me. But I will sacrifice to you with the voice of thanksgiving; I will pay what I have vowed. Salvation is of the LORD. Jonah then goes to Niniveh and announces that “Yet forty days, and Nineveh shall be overthrown”. (Jonah 3:4). Then the inhabitants repent and God decides not to destroy the city. Jonah is disappointed but finds happiness under the shade of a gourd vine; God will explain to him that he wants repentance and not the death of the fishermen. In Matthew 12:39-41, Jesus proclaims the sign of Jonah: as Jonah spent three days inside a sea monster, in the same way the Son of man will stay three days buried under the earth. Three scenes become symbolical: Jonah cast into the sea and eaten up by a fish is the image of death. Jonah cast out by the fish onto the shore is the image of resurrection. Jonah under the shade of the gourd vine is the image of eternal life in paradise. The big fish is related to a whale or a sea monster. Jonah’s coming out of the fish is always a sign of resurrection. The memory of this stay inside the belly of the whale is to be found again in the story of Pinocchio. The famous puppet starts looking for his father who is in the belly of the whale; they come out by lighting a fire to make it sneeze. Nowadays, the sea is no longer a place evoking death, and the whale, threatened with extinction, has become a friendly beast. Beware not to confuse the whale with the dolphin. The latter was famous as early as the antiquity to rescue shipwrecked people at sea. Then it soon became for pagans a favourable sign and for Christians a sign of salvation. Coptic Stele, Musée du Louvre, Paris. But in the story of Jonah, the fish does not represent salvation but death; therefore it cannot be replaced by a dolphin.